Panasonic Jaguar Racing’s Mitch Evans took the first ever chequered flag for both him and the British team at the GEOX Rome E-Prix - becoming the seventh different winner across the first seven races of the ABB FIA Formula E Championship. Reigning champion Jean-Eric Vergne took his first win of Season 5 of the ABB FIA Formula E Championship in the home race for his Chinese-backed DS Techeetah team at the Sanya E-Prix – the sixth different winner in the first six races. Britain's Sam Bird claimed the chequered flag in the HKT Hong Kong E-Prix - but the Envision Virgin Racing driver is under investigation by race stewards for a late collision with Andre Lotterer. Brazilian Lucas di Grassi claimed one of Formula E’s most dramatic victories, as he pipped Mahindra’s Pascal Wehrlein right at the chequered flag in Mexico City. BMW i Andretti Motorsport suffered a moment of madness in the ABB FIA Formula E Championship race in Marrakesh as teammates Antonio Felix Da Costa and Alexander Sims crashed into each other and out of the race when cruising to a one-two victory. Antonio Felix da Costa narrowly clung on to victory in Ad Diriyah, fending off a fast-charging Jean-Eric Vergne in the closing laps to deliver a maiden win in the ABB FIA Formula E Championship for BMW i Andretti Motorsport. Last night in central London Formula E launched Season 5 of the ABB FIA Formula E Championship as 'The Fiercely Driven' brand identity was also unveiled. Jean-Eric Vergne finished the season in fitting style as the ABB FIA Formula E Championship winner won the final race of the season in New York City – however his victory couldn’t stop Audi winning the Teams’ Championship by just two points. Jean-Eric Vergne drove from the very back of the grid to win the ABB FIA Formula E Drivers' Championship, as Lucas di Grassi won a dramatic race in New York City on Saturday. F1 legend Emerson Fittipaldi admitted he feels Formula E is the better showcase for driver ‘talent’ than Formula One as debate rages on about the direction of series in which he made his name. The ABB FIA Formula E Championship title race was blown open in Zurich during one of the most dramatic races of the season as motor racing returned to Switzerland – Sam Bird cutting Jean-Eric Vergne’s lead in the Driver’s Championship from 40 to 23 points. Germany’s Daniel Abt romped to a home ABB FIA Formula E Championship race win in Berlin to cap off the perfect day for fans who watched manufacturer Audi record a one-two at the BMW i8 Berlin E-Prix. Idris Elba showed his driving pedigree ahead of the Formula E race in Paris, as he raced a Formula E electric race car through the city streets. Jean-Eric Vergne was the toast of Paris as he took a huge step towards the ABB FIA Formula E Championship title after winning in front of a partisan home crowd. Sienna Miller brought some additional stardust to a historic day in Rome as the ABB FIA Formula E Championship made its debut in the Eternal City. Britain’s Sam Bird roared back into title contention with victory in the inaugural Rome E-Prix – and the 31-year-old admitted he never expected to be in this position coming into the business end of the ABB FIA Formula E Championship. Jean-Eric Vergne extended his lead at the top of the ABB FIA Formula E Championship as he took the win in Punta del Este, but he was pushed all the way by reigning champion Lucas di Grassi who marked his return to the podium. Daniel Abt became the first ever German winner of a Formula E race, as he took the chequered flag following a dramatic fifth E-Prix of the ABB FIA Formula E Championship in Mexico City. TECHEETAH secured a historic one-two as Jean-Eric Vergne and Andre Lotterer finished first and second in the ABB FIA Formula E Championship E-Prix in Santiago, Chile. Kylie Minogue experienced the excitement of electric street racing today, as the music star attended the ABB FIA Formula E Championship for the Antofagasta Minerals Santiago E-Prix in Chile. Mahindra Racing’s Felix Rosenqvist won his second race in a row after a flawless performance at the Marrakesh E-Prix knocking Britain’s Sam Bird off the top of the ABB FIA Formula E Drivers’ Championship. A-List stars flocked to Formula E’s Marrakesh E-Prix today as Orlando Bloom celebrated his 41st birthday – and added his support for the electric racing series. LONDON, UK (January 9, 2018) - Formula E is teaming-up with ABB in a ground-breaking new collaboration as the title partner of the ABB FIA Formula E Championship and putting its name to the electric street racing series. The latest news from Formula E as Season 4 of the the FIA Formula E championship gets underway in Hong Kong on Saturday 2nd December and Sunday 3rd December 2017. 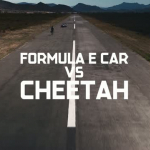 The all-electric Formula E car and the world’s fastest land mammal can both reach speeds of 0-100kph (60mph) in 3.0 seconds. 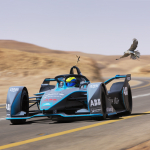 A film, released by Formula E is raising awareness of the threat of climate change to wildlife ahead of next week’s UN Environment Assembly. The new Formula E season begins on Saturday 2nd December in Hong Kong.